The Galaxy Tab 7.0 Plus gallery is a pretty standard Android affair in terms of functionality, but it has too been tweaked to feel more comfortable on the large screen. Naturally, your Picasa web albums are automatically synced with your tablet. The upper right corner holds the sorting options, shortcuts to the camera, image details or extra settings (like make available offline for Picasa albums). Quite expectedly, the Galaxy Tab 7.0 Plus gallery shows the images in full resolution so you can see the finest available detail in your images. If you want to zoom precisely to 100% just use the double tap gesture. If you feel like it you can zoom in even further - up to 200%, though we can't quite see why you would need to. Samsung have blessed the Galaxy Tab 7.0 Plus music player with the familiar TouchWiz custom interface, which we find more functional than the stock Android one, even if it lacks the cover-flow-like browsing. Finally, if there is a track playing in background a dedicated row appears in the notification area showing its name along with the usual music shortcuts (something missing on the Honeycomb 3.1 version on the bigger Galaxy Tabs). There is also an option to shut down the music player directly from this menu. Stock Android Honeycomb doesn’t have a dedicated video player app but Samsung always provides one of their own for the Galaxy Tabs and so it made its way to the Tab 7.0 Plus. Allowing for thumbnail, list and folder view modes, it’s a pretty functional application. There’s also searching so even if you fill that ample storage with short clips you should be able to find the one you need. The Galaxy Tab 7.0 Plus supports DivX/XviD/MKV files out of the box. Performance with higher-res videos is great – it played ALL videos up to 1080p (including) like a champ - smoothly and hassle-free. Subtitles are also available and there is rich encoding support. We really tries to find something the Tab 7.0 Plus won’t play, but without success. It seems Samsung has put support for every common audio and video codec making the Tab 7.0 Plus a real monster when it comes to video playback. There are a few full-screen options too - normal, fill and stretch. 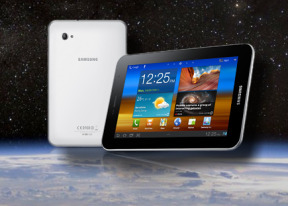 Samsung slates are traditionally doing well in our audio quality test and the Galaxy Tab 7.0 Plus is no exception. 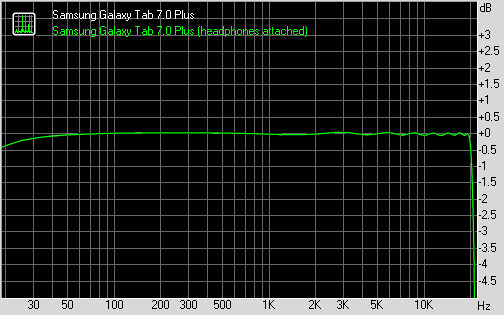 When connected to an active external amplifier, the Galaxy Tab 7.0 gets amazing scores all over and if it wasn't for its low volume it would have been really perfect. With headphones plugged in, the output is still impressively clean for the most part. As a matter of fact stereo crosstalk is the only affected reading, but sadly that one took too big a hit to let us call the Galaxy Tab 7.0 excellent. It's certainly good, but true audiophiles will find better places to spend their money.